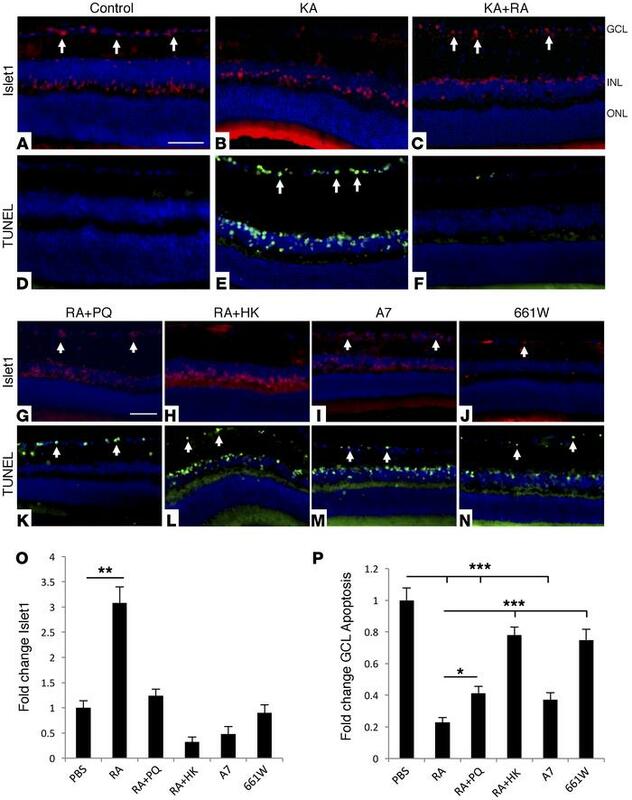 Transplanted RAs protect inner retinal neurons in vivo. (A–C) Transplantation of RAs increased survival of GCL and INL neurons following KA-induced injury, compared with PBS-injected controls (Islet1: red, arrows). INL, inner nuclear layer; ONL, outer nuclear layer. (D–F) Adjacent sections were TUNEL stained (green, arrows), and show a complementary pattern, with reduced apoptosis GCL and INL in eyes with transplanted RAs. (G–H) Rescue of Islet1-positive neurons was reduced or absent when RAs were prestressed by treatment with 300 μM PQ (RA+PQ) or heat killed (RA+HK). (I and J) Transplants of A7 or 661W cells were also not protective. (K–N) Corresponding TUNEL staining showed higher GCL or INL apoptosis in the controls compared with RA transplants. (O) Quantification of Islet1 results for each group, showing significant protection of GCL neurons by RAs that is absent in each of the controls (n = 10). (P) Quantification of TUNEL results for each group, showing a significant reduction of apoptosis by RAs that is lower or absent in the controls (n = 10). Scale bars: 50 μm. *P < 0.05; **P < 0.01; ***P < 0.005 compared with PBS. Bars represent SEM. Statistical analyses were performed by 1-way ANOVA with TUKEY post-hoc test.